The Fish Caught the Williams Brothers, and Their Best Fish Are Becoming Legends. The osprey is a large fish eating bird, with a variety of live fish accounting for about 99% of its diet. Tod Williams’ Osprey is a 50 foot commercial fishing boat. Rigged with trap nets, it hauls in 6,000 pounds of whitefish on a good day, then chugs her way back to her temporary port in Caseville. The Osprey isn’t just any boat to Tod; he built her himself, under the direction of local expert boat builder Fred Brown. 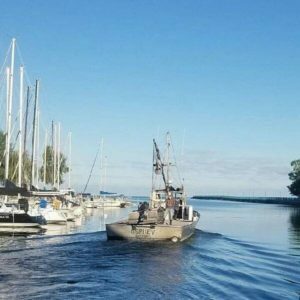 She’s served him and the Bay Port Fish Company crews well, faithfully weathering the volatile conditions on shallow Saginaw Bay. Commercial fishing was not the career Tod had in mind when he was growing up. He doesn’t come from a long line of fishermen. In fact, he tried his hand at being a cowboy in Nebraska after he left Michigan State University. It wasn’t long, though, before he returned to Michigan, where his brother Forrest had been working in the hotel industry. Tod says he really likes being his own boss, working in the fresh air with good people and providing a healthful product. About the only down side to commercial fishing, Tod says, is pulling up nets in foul weather. The Bay Port Fish Company is always looking for good opportunities, such as selling some of their catch at farmers’ markets, where clientele appreciate buying fresh fish directly from the fishermen and getting some tips on taste tempting techniques. The Williams’ experience in the hospitality industry has taught them much about customer service and providing a quality product. The fishery is now managed by Tod and his daughter Lakon Williams.